However, the decrease in energy use was partly explained by lower economic growth reducing the demand for energy following the global financial crisis of 2008-2009. Significantly, countries where CO2 emissions decreased the most were those with the largest number of energy and climate policies in place. The data suggests that efforts to reduce emissions are underway in many countries, but these efforts need to be expanded and enhanced to limit climate change to well below 2 °C of warming, in line with the Paris Agreement. The authors argue that "untangling" the reasons underlying recent changes in emissions is critical to guide efforts to tackle climate change. Lead researcher Prof Corinne Le Quéré, of the Tyndall Centre for Climate Change Research at UEA, said: "Our findings suggest that polices to tackle climate change are helping to decrease emissions in many countries. This is good news, but this is just the start. There is a long way to go to cut global emissions down to near zero, which is what is needed to stop climate change. Deploying renewable energy worldwide is a good step but by itself it is not enough, fossil fuels also have to be phased out." Dr. Charlie Wilson, also from UEA, said: "New scientific research on climate change tends to ring the alarm bells ever more loudly. Our findings add a thin sliver of hope. It is possible for countries to peak and then decline their emissions year in year out. "Eighteen countries so far have shown us how concerted policy ambition and action on energy efficiency, renewables, and climate targets can work. Now we must make sure these early precedents become the rule not the exception. This is a huge global challenge." 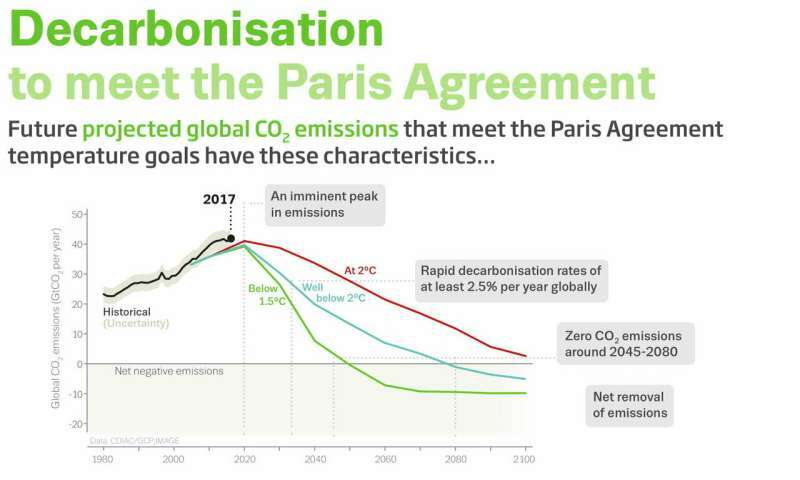 Global CO2 emissions would need to decrease by about a quarter by 2030 to limit climate change well below 2 °C, and to decrease by half to stay below 1.5 °C. Global CO2 emissions increased by 2.2 per cent per year on average between 2005 and 2015. Co-author Dr. Glen Peters, of the CICERO Center for International Climate Research in Oslo, said: "Global carbon dioxide emissions rose in 2017 and 2018, suggesting that the rapid rollout of renewable energy has so far not been sufficient to arrest the growth in fossil fuel use. "Energy and climate policy has been successful at supporting renewables and energy efficiency, but to realise meaningful emission reductions supporting policies are needed to penalise the emission of carbon dioxide." 'Drivers of declining CO2 emissions in 18 developed economies', Corinne Le Quéré, Jan Ivar Korsbakken, Charlie Wilson, Jale Tosun, Robbie Andrew,Robert J. Andres, Josep G Canadell, Andrew Jordan, Glen P Peters and Detlef van Vuuren, is published in Nature Climate Change. Global recession due to peak-oil hits poor countries harder. And, the news is regurgitated as touchy-feely climate-changie carbon emission reductions. Mostly this is to keep the debate about where the loss will fall away from any informed democratic process. What's laughable is that if some sunspots don't start coming back in a few years we'll be entering into another little ice age. Germany, which is the major industrial giant of the EU, has been shutting down its zero emission nuclear power plants and replacing that energy source mainly with coal energy power plants. Renewables have increased but make up only a very small proportion of their energy. What with that, how could it be their demand for fossil fuels is dropping? I call it BS. Germany knows those nuclear power plants and their respective fuel pools are targets in WWIII that will render whole nations unlivable for millennia, rather than decades. Germany has also invested heavily in ubiquitous rooftop solar energy. Call it what you want, "Duude "
Future projections and future reality are two different things.